SAN FRANCISCO  Signal coin columnist Sol Taylor was honored by his peers Thursday for the best coin column in a non-numismatic publication. "Terrific. Totally unexpected," Taylor said when told of his victory Friday during the American Numismatic Association's summer convention in San Francisco. Taylor, of Sherman Oaks, specializes in Lincoln cent varieties but writes a weekly column for The Signal newspaper of Santa Clarita, Calif., on a broad spectrum of coin-related topics intended to appeal to collectors and non-collectors alike. "It's a very fine column. It appears to run the gamut of the hobby," said Ed Reiter, executive director of the Numismatic Literary Guild. He said Taylor was recognized for his body of work in The Signal, rather than for a single week's submission. 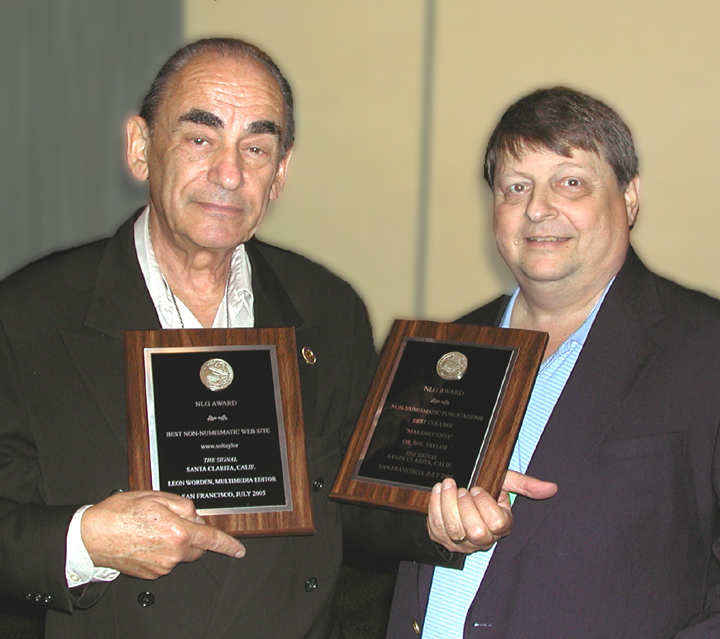 NLG, the organization of professional coin writers, gave more than 50 awards in 34 categories  from book-of-the-year ("Illegal Tender" by David Tripp) to best spot numismatic news coverage ("Fakes Abound in Online Sales" by Rita Laws of Coin World)  in its annual writing competition. Taking the top prize for Web site operated by a non-numismatic organization was The Signal for soltaylor.com, where Taylor's Signal columns are posted. The site also features frequently updated coin news bulletins. Taylor, 74, started collecting coins in 1937 when his father brought home three shiny Lincoln cents from the meat market he owned in Brooklyn, N.Y. Taylor has written about coins since high school and is best known as the author of "The Standard Guide to the Lincoln Cent," now in its fourth edition. His column has appeared in The Signal since December, soon after Reiter, as senior editor of the mass-market magazine Coinage, lamented the dwindling number of coin columns in regular newspapers, where years ago they were a stock feature. The Signal contacted Reiter to locate a qualified coin columnist; Reiter put out a call within the numismatic writing community and Taylor stepped up to the plate. With coin collecting on the rise since the 1999 introduction of the 50-state quarters and the new Jefferson nickel designs, Reiter said he finds it distressing that newspapers have been slow to catch up. "The U.S. Mint estimates that something like 130 million people save coins in some form, not just sticking them in a jar, but looking at them," Reiter said. "There are many more people putting together sets (of coins) than 12 or 15 years ago, but there has not been corresponding coverage in newspapers. I'm delighted that your newspaper introduced (a coin column), although I know you had one in the past." Valencia resident and Los Angeles-area media personality Alan Mendelson wrote a weekly "collectibles" column for The Signal in recent years but it was preempted when he renegotiated his CBS contract. Scott A. Travers, author of several acclaimed books on rare-coin investing, chaired the NLG's 2005 Writers' Competition and said competition was fierce in all categories. "We had the greatest number of entries received this year than in any year in the past decade," he said. Taylor's double win gave Travers an opportunity to acknowledge a mentor. At age 15, Travers, now 43, attended ANA seminars on coin grading that Taylor taught. 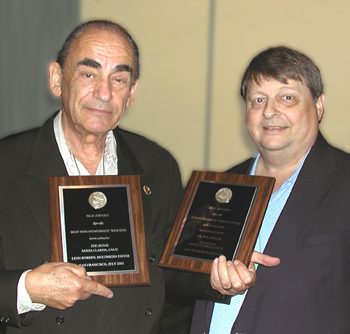 "(Taylor's seminars) formed the basis of my knowledge about coin grading," Travers said. "A lot of my work ... really reflected the knowledge that Sol taught me." Particularly memorable to Travers was a laboratory class Taylor taught to show the difference between natural and artificial toning. Attractive natural toning can increase a coin's value, while fakery diminishes it. "When I was Sol's student in 1977, we spent an entire day experimenting with chemicals and coins," Travers said. Taylor, a retired college professor by trade, continues to impart a lifetime of knowledge about Lincoln cents to the rarefied specialist. A featured lecturer at the ANA convention, Taylor told his audience Friday to "know what you're looking for, know where to look, and get a (10-power magnifying) glass"  because some errors that are invisible to the naked eye can increase a coin's value by a factor of 10 or even 100. Beyond the famous 1955 doubled-die cent and the common 1995 doubled die, Taylor said there are about 200 other doubled-die and repunched mint-mark combinations in the Lincoln cent series  including several he discovered. "The mint has a 99.97 percent accuracy record, but it's the .03 percent where the fun is," he said. "The mint makes over 10 billion coins a year. It's bound to make a couple that are strange." Taylor is the founder of the Society of Lincoln Cent Collectors and past president of the Numismatic Association of Southern California, which has honored him with numerous literary awards through the years. As for his award-winning Signal columns, he said, "I write on different (numismatic) topics I think the average person will read. I wasn't writing to earn a prize."